Seeing pictures posted by Dr. A (I believe) showing where he had removed ingrown hair cysts from a previous donor incision? » ingrown hair cysts from a previous donor incision? It was Dr. A, I remember that pic, one word: DISGUSTING. 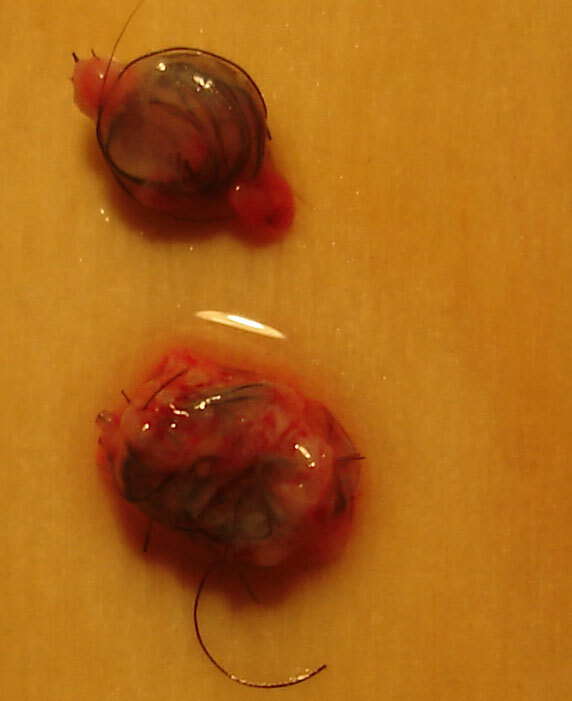 Yes, they were pictures of curled up, mutant-looking hairs encased in goo. Yes, they were pictures showing what can go wrong if clinics profess to offer fue without proper training. 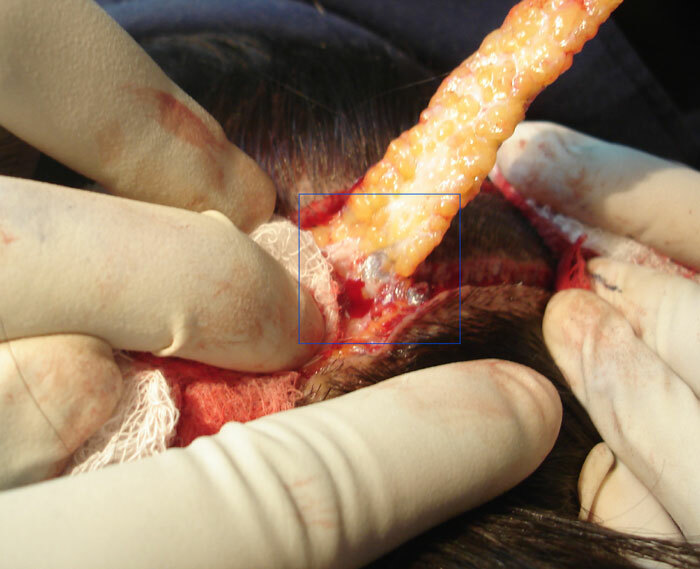 In that case, and 2 others, we saw patients that had been operated by a particular clinic, where entire “minigrafts” had been cored and were found residing below the healed dermis. Full depth coring with, probably, a blunt punch. 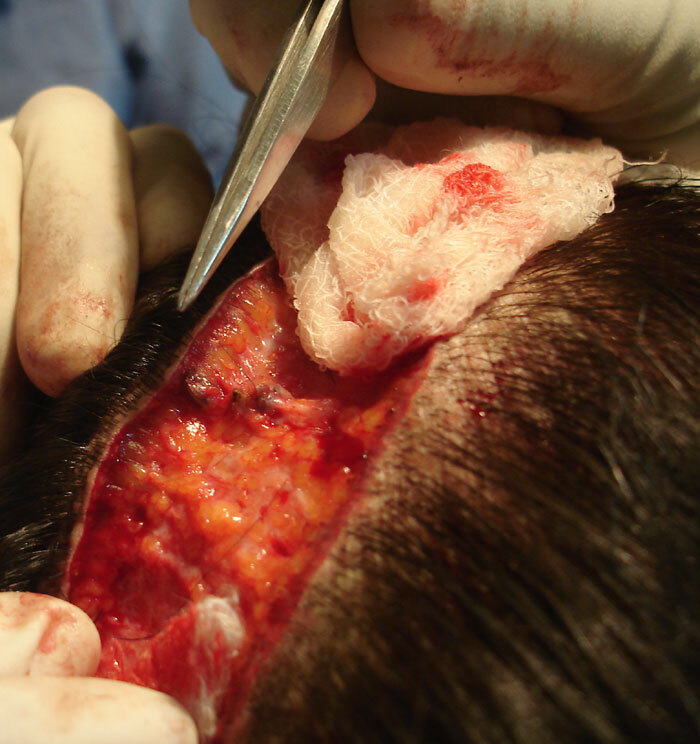 These 2 factors may have led to the grafts slipping below the dermis. We have submitted the case series for publication. While extracting the strip, they found the follicular unit grouping (outlined in the blue square). On further examination, these had hair that had grown to 1 to 2 inches in length. Some were also found on the lower surface of the strip. These were separated from the strip. Following is a picture of two of them. They consist of a jumble of live hair, skin and its dead derivatives, alongwith the granulation tissue formed as a result of the body’s protective instinct to encapsulate them. I was wrong. I thought that it was from improper donor closure in a strip procedure. It is fascinating yet quite disgusting. Thanks to both for the replies. I remember the post. The patient was repaired by Dr. Arvind and follow up pictures were posted at 5 mths. Its so important not to rush into an HT and do your research well.